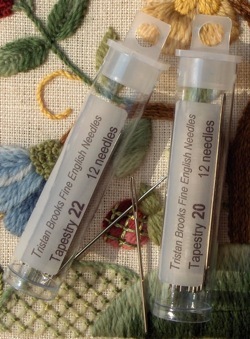 Needles are one of the most basic — and most necessary — of our stitching supplies. We have packaged 12 of the finest quality English needles in a transparent plastic tube with a secure cap for safe storage. These needles area as smooth as butter as they pass through your fabric. How many times have you found half your needles on the floor? Or even worse, been unable to find them anywhere? The tube will help keep needles safely tucked away from dampness (which can cause rusting) and from falling off the side of your work. Please note that Crewel and Embroidery are the same long eye needle. The name changes as the needles become smaller. Each tube is labeled with the needle size and type for easy identification and organization.